Kevin and the clan came home yesterday evening and called to the house this morning wondering if... Of course, says I, why not. And so we did. To be honest, we set off with the casual intention of doing the same as we did last week: our three mile 'up and down the road' route. However, when we hit the turnaround spot I asked Kevin if he wanted to push on up to the four mile mark. When we got as far as the four mile mark, Kevin mentioned that he had hoped to get close to a 12k run this weekend, so we set off towards Doilín, and a 7 mile run. 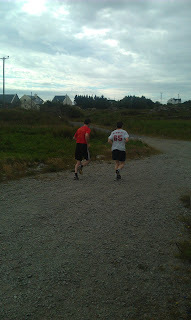 I's great to run with good company - one pushes the other and the the conversation shortens the distance. We ran the hills with gusto and slowed down when we needed to. There was nary a bit of rain and the weather, though gloomy for summer, was fine for running purposes. A nice run, good company, great distance. 3 Miles with a Twist. You can't beat a summer's Saturday morning. I got early to give the students their breakfast, and with a long free day stretching far ahead, I tore into some serious house cleaning - basically turning the house upside down, cleaning and mopping and mopping and cleaning! After about four hours of housework I decided to reward myself with a 3 mile run... my usual 'up and down the road' jaunt, but with one little twist in the tail. On reaching the turnaround point I decided to head right, instead of turning directly back down towards the house. This right turn would bring me on a nice little loop, stretching the 3 mile mark marginally in terms of distance, but significantly in terms of difficulty. The road is known as Bóithrín an tSagairt (the Priest's Road), and is basically an unforgiveable hill that leads to the highest point on the peninsula. From here, on a clear day, you can see as far as the Island of Garumna to the west, and out to the Aran Islands to the south. I huffed and puffed up the savage hill and felt gggggreeeeeeat at the very top. Just like Tony the Tiger. The rest of the run was easy peasy after this! Throughout I hummed the infectious 'what you focus on grows' tune that I heard the last day. Running can be a great old life motivator...! The lads make toast on the bonfire! 23rd of June is known as St. John's Eve, or Oíche San Seán - a time when villages along the west coast of Ireland are lit up with bonfires galore... There are 15 teenage students living in our house at the moment (learning Irish) so we gathered as much wood as we could, threw a bag of turf on top, splattered with some petrol and awwwway we went! I got some bread and jam and the lads were trying to toast the slices as they dangled at the end of thin branches - faces were burning for the sake of the toast! A lovely night - at least we kept up our side of the bargain. Juneathon was ticked with some sit ups! There's nothing for me to do today but highlight a fantastic blog post from Julia, at Running to Learn. This post is exactly why I love to keep a blog - to find inspiration like this! Nice to run with company - well provided today by brother Kevin! I've been letting myself down lately - dropping standards, dulling ambition, doing things badly. I slipped with my Juneathon quest again yesterday, though that doesn't really bother me too much, it's the quality of what I've been doing recently that is gnawing at me. This morning I had reason to be in a field beside our house and heard the clearest cricket song. The little fellow was relentless, hiding somewhere in the long grass, he chirped and chatted away to the world like a madman amusing himself. Our place is usually full of birdsong in the morning, but today belonged to this little fellow. My brother Kevin was at home, so we decided to go for a run when my student lodgers left for college. It's nice to run with a bit of company every once and awhile. We did my usual 'up and down again' route, marking the 5k turnaround point at Cóilín Daddy's. Our pace was brisk enough and we even decided to stretch it out for the last 1k. I was upbeat again after this run, and decided to look at some positives: I may not be training as hard as I was last year, but I'm still at it and, though they be short jaunts, I've still competed well enough for Juneathon. Not too bad, an do better! Not fun, not a run, but done. 30. Got up and down for a quick 1.5 miler this evening. Not too many spectators out to cheer me on as I continue my Juneathon quest - very disappointing! Yesterday I did some sit ups, but failed to blog them up in accordance with Juneathon rules, so technically I'm out. However, I'm going to plough on anyway - surely a 90% success rate is better than nothing! Today I ran a paltry mile - it's all I had time to do... better than nought. Following yesterday's fantastic run, and lovely weather, comes a dank and dirty day of sit ups, press ups, and not a bit of running. Still it keeps Juneathon ticking, somehow! Out the road at 7pm, down towards the lighthouse and back up again. Not a mile gone when the heavens open and I'm being lashed - punished for past sins, or sins of a past life or just punished. Or am I being treated to nature's greatest cleanse? While the world inside four walls can look out with dread at June rain, the runner is quick to adjust, and even delight in it. All day long I felt sluggish, but all of a sudden I'm revived, galloping up Ard na Bleaistéirí, past my mother's house, nearing the top of the hill at Connolly's and still stretching the legs. By the time I got as far as Matt Tom's I was ready for London 2012. My intention was to go out for 3, but I ended up stretching it to 5. And I loved every minute! A windy but bright June day and after work I trotted the prom at a slow enough pace. The place was full of walkers, as always, but funnily enough it was low on the runner barometer for some reason. Felt good, but didn't push the pace too much... Juneathon ambles on..
To keep Juneathon just about going, I trotted out for a one mile run today - up and down the road was all. I was under a wee bit of time pressure, so good just to tick a box and funnily enough, it felt like enough! Back tomorrow with some serious running (I hope). King Cong (well, King of the Cong 8K!)... Deep in the woods of Ashford Castle.. The run a monthers were in fine form today for the Cong 8k... Cong is a gorgeous little village in the west of Ireland, just on the border of Counties Galway and Mayo and famous for two things: A) it was the site of a famous John Wayne movie called The Quiet Man and B) there is a beautiful old castle in the village (now a hotel) called Ashford Castle - where so many famous Kings, Queens and Presidents have stayed over the years. The run, which started on a little off-road just outside the village, was one of the most satisfying I've done for a long time. Just two short miles today on the Galway prom after work... It was the nicest day of the year so far - almost to hot for running! Men, women and children were out in their bikinis in Salthill. Yes, everyone in bikinis. Day 3 of Juneathon done! Day 2 Juneathon - 1 Mile Run. Didn't even need shorts for this one! I have rarely done a run as short as this, but with time being scare and the legs being slightly heavy after two days running in a row, I decided it would be good to mark day 2 of Juneathon with the shortest of hops, out the door, down to the pier, and up to the one mile marker. On a beautiful even, it was a beautiful idea! Day 1 of Juneathon... 5 miles. June is back, and so is Juneathon, that weird and wonderful jogger/blogger marathon when we sign up to run or exercise every day and blog about it, every day! I muddled through last year with some, well plenty, sit-up days, but this year I am determined to run a bit more if I can! I had my heart set on a run in the neighbouring village of Spiddal today with the rest of the Trísport club but had to come home and attend to some house fixing work due to the imminent arrival of 15 young teenagers on Monday (for the first of three summer camp courses for which we are a host houses!). With my Spiddal plan scuppered I decided to do my usual up and down the road run. The legs were weary enough for the last mile or two, but generally I did ok, for the first day that is! Good luck to all other Juneathoners... let the games begin!! !